Beatrice Gormley - Back to the Titanic! 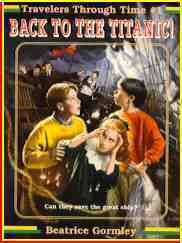 Buy "Back to the Titanic"
I've always loved stories about time travel. I've always loved stories about different times in history. I've especially always loved stories about time travel to different parts of history. I don't know why it took me so long to get around to writing the Travelers Through Time series! Part of the fun of writing this first book in the series was making up the TASC (Time and Space Connector), the time travel device. What would it look like? How would it work? What problems might the three kids from the present -- Matt, Emily, and Jonathan -- have when they tried to use the TASC? I loved finding out about the Titanic, that enormous, gorgeous ship, and all the fascinating people on board in April 1912. Some of those people could have saved the mighty ship and everyone on board, if only . . .
Can Matt, Jonathan and Emily save the great ship? Can they save themselves? Can they save the great ship? Matt and Emily's great-grandfather is an inventor, and he's just created the greatest invention of all - a way to travel through time. He plans to return to the Titanic, which he sailed on as a boy, and try to save it. But when he breaks his ankle it looks as if his plans have been ruined. Until Matt, Emily, and Matt's best friend, Jonathan, find the invention. Jonathan, a real science whiz, figures out how to make it work. In a snap, the three kids travel back nearly one hundred years. They are on the Titanic! Can they save the great ship before it hits the iceberg and sinks to the bottom of the ocean? And more important, will they be able to get back to the present time? Praise for Back to the Titanic! Our school is very special in that all students here are either blind or have low vision or other visual impairments. We have just completed a novel study of Back to the Titanic. Some of us read it in large print and others read it in Braille. . . . We wanted you to know that we think your book was "cool," "super," "neat," "excellent," and "I'd recommend it to students anywhere!" . . . As a teacher, I found the book exciting and a great resource. I really enjoyed how you mixed fact with fiction. . . . Thanks for your great book. "I am also the book coordinator for my school. One of your books, Back to the Titanic, is on our list. It is wonderfully written. I really enjoyed reading it, and have used it as a read aloud. Several of my non-readers (they hate to read) have asked to borrow the book. They have even gone out and bought a few of the others." A boy from Buenos Aires, now leader of the world's Catholics. The inspiring story of a leader in the South African struggle for freedom. Story of the author of Little Women. A heroine of early aviation. The presidents' wives, from Martha Washington to Michelle Obama. Story of the author of the beloved Chronicles of Narnia. The story of the author of the "Little House" books. Two friends are pulled apart by pre-Revolutionary War tensions in Boston. One moment Adara is a landowner's privileged daughter; the next, she's a slave in a foreign noble's palace. Andrea orders wings through the mail--with a guarantee to fly. Gretchen would do anything to be in the play . . .
Sequel to Fifth Grade Magic! Cats, friends, aliens: a hilarious mix! What is a vratch? Richard doesn't know, but it's in danger . . .
© All site content © 2018 Beatrice Gormley. All rights reserved.